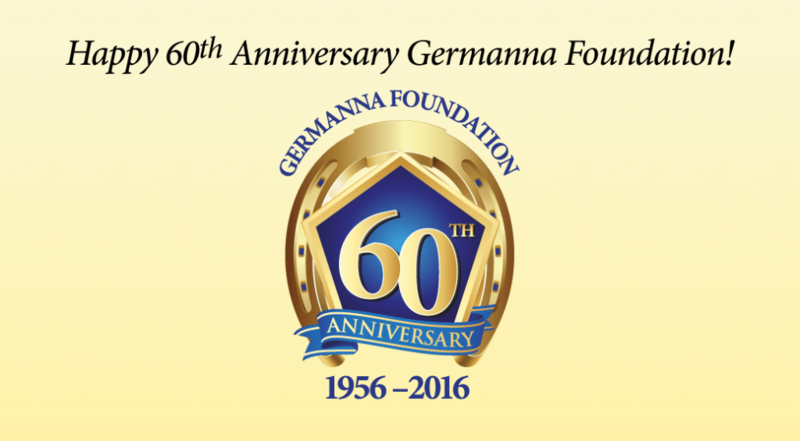 March 14, 2016 is the 60th anniversary of the creation of the Germanna Foundation! On March 14, 1956, 60 years ago, the Germanna Foundation was officially incorporated as the Memorial Foundation of the Germanna Colonies in Virginia, Inc. Following World War II, a small group of Germanna descendants, led by Brawdus and Evelyn Martin, began gathering one Sunday each year for a family picnic near the site of Governor Spotswood’s Enchanted Castle. By 1949, a permanent organization called the Society of Germanna Colonies was founded and the picnics were formalized with programs for the public. In 1954, Society President Dr. Charles Herbert Huffman wrote a letter of greeting and reconciliation to the people of Siegen, Germany on the occasion of the reconsecration of the St. Nicolai church. A woman clipped the German translation of this letter she read in the newspaper, and mailed it to her brother, Ernst Flender, a successful New York financier who was an early 20th century immigrant from Siegen. After meeting with Dr. Huffman and learning more of the story of the German-speaking westernmost settlement of the British Empire at Germanna, Mr. Flender donated stock to enable the purchase of 270 acres of land including much of the original Germanna tract. The Germanna Foundation was born. In 1969, 100 acres of that historic property was donated to the Commonwealth of Virginia to launch Germanna Community College. 1927-The Evangelical Community of Muesen, Germany, carried out an elaborate anniversary celebration of its 300 years of history, and very appropriately took steps to link up the Germanna colony of 1714, composed of families from Muesen and Siegen, the first German Reformed congregation in America. Contact with Germanna was effected through the American Consul at Cologne, President Coolidge, and Governor Harry F. Byrd of Virginia, at whose instance Mr. J. R. Horsely, Field Assistant in the Virginia Conservation and Development Commission, had photographs made at Germanna and the Spotswood Furnace. Dr. H. J. Eckenrode prepared an historical commentary to accompany the photos. 1930-The Virginia Department of Conservation and Development erects at Germanna two large metal tablets inscribed with pertinent data to mark the historic peninsula encircled by the Rapidan River. 1934-Orange County observes its bicentennial. On September 25th an elaborate program was carried out at Germanna, at which time and place Dr. Hans Luther, German Ambassador to the United States, made the principal address. 1953-April 26th Granite shaft, honoring the 1714 colony, unveiled at Germanna, with program. 1954-The Germanna Journal, Vol. 1, No. 6, mimeographed, by Brawdus Martin and Mrs. Agnes L. Kemper. 1956-January, The Memorial Foundation of the Germanna Colonies in Virginia, organized, trustees named, approved by Circuit Court. 1956-March, The Memorial Foundation of the Germanna Colonies in Virginia, chartered by the Virginia Corporation Commission. 1956–June, The Memorial Foundation purchases 270 acres of the Germanna peninsula and presently christens this tract “Siegen Forest,” thus perpetuating the name of the city Siegen in Germany whence many of the 1714 colony emigrated. 1957-May, Attractive plaque designed and constructed by J. B. Carpenter, Sr., placed alongside Siegen Forest. 1958-August, The Memorial Foundation of the Germanna Colonies, Inc. is declared a non-profit organization and, consequently, exempt from Federal income tax assessments. Exemption includes: “Contributions made to you are deductible by donors in computing their taxable income in the manner and to the extent provided by section 170 of the 1954 code.” Subsequently, exemption from State and local tax assessments passed by the Virginia General Assembly, in regular session. 1959-Virginia Highway, No. 3, between Culpeper and Fredericksburg, christened GERMANNA HIGHWAY, by authority of the Virginia State Highway Commission. 1961-The Pavilion, pentagon-shaped to remind all of the block-house described by John Fontaine in 1715, constructed and dedicated. 1961-Granite shaft unveiled and dedicated, memorial to the 1717 colony. 1961-Granite shaft, memorial to the 1714 colony, dedicated in 1953, removed from its first location and relocated in Siegen Forest. 1961–The Germanna Record launched, official publication of the Germanna Memorial Foundation. 1964–Observance of the 250th anniversary of the arrival at Germanna of the Nassau-Siegen immigrants, April, 1714, Anniversary address by U. S. Senator Harry F. Byrd. The primary purpose of a foundation is to support the superstructure. If the building is to be a beautiful one, meaningful and enduring, and if it is to mellow gracefully with the passage of time, the foundation must be laid carefully and well. Our Memorial Foundation, we are persuaded, does rest upon a solid footing. The four cornerstones are the enduring verities, shall we say, that were bequeathed to descendants, yes, but more broadly still, bequeathed to all the peoples of this nation. The first one of these four verities that lie at corners of the Memorial Foundation let us denominate courage. In the summer of 1713 a small band of enterprising persons, numbering in all about forty, got together and entered into a solemn compact. Briefly, they agreed among themselves to turn their backs on home, friends, relatives, and Fatherland, and turn their faces westward by accepting the invitation, then in their hands, to come to America. This momentous decision required a quality of courage of the highest and purest type. It is this quality of character that they brought with them from their native Siegen and environs to their new life in America. The first colony arrived here at Germanna in April, 1714. The first was followed by others of like character and purpose in 1717 and in 1719. The second cornerstone may appropriately be named skill and craftsmanship. The ‘invitation to come to America was first extended only to such as were endowed by nature and by training with sound knowledge and superior skill of hand and brain. Their specialty was iron ore mining and metallurgy. We are confronted today with the assertion, displayed in almost every magazine, “Only steel can do so many jobs so well.” But specific processes which made this development possible were unknown in America in the early 18th century. Indeed such were not well understood among Englishmen until these skilled craftsmen arrived and explained the science. The initial stages were undertaken here under able leadership from Siegen, Germany. Today iron and steel constitute one of the basic factors of our national economy. The third cornerstone of the Foundation is independence of religious and political ideals. Here at Germanna our forefathers established the first organized congregation in America of the German Reformed Church. This deliberate act on their part, in violation of precedent and established practice, was not so simple and easy as it is today. Indeed it was a bold and daring venture, owing to the intolerant and generally hostile attitude of the Established Church toward other religious sects. But despite such obstacles and deterrents they proceeded to conduct their worship according to their custom and ritual, once each week day and twice each Sunday. The blockhouse, which was intended only as a protection against attacks of hostile Indians, they used as a house for worship. It has always seemed to me significant and indeed a bit ironical that this provision which Governor Spotswood made for imminent war they made use of for permanent peace. So far as is known our colonies were never attacked by the natives, nor were they ever molested by them. They took no part in the entangled web of politics with religion, the prevailing mode then in Colonial Virginia. True, they were not missionaries for their faith and form of worship, but in the matter of religious freedom they did assert their independence. They desired to worship as they chose without let or hindrance from others. Resenting interference from others, they scrupulously avoided provoking the suspicion and displeasure of others. In the practice of their religious tenets, to paraphrase Mr. B. Thus it is evident that they were not granted toleration. They won it. And thus it occurred, too, antedating by a half century or more Jefferson’s statute for Religious Freedom in Virginia, they pointed the way and demonstrated by their example the feasibility of complete separation of church and state, a common heritage, dear to us today. Let us call the fourth verity Democracy. It is certain that a calm, even-tempered, and exemplary democratic spirit was the controlling force of their life and thought. In 1719 or 1720 the first colony patented a large body of land in what is now Fauquier County, moved there and founded Germantown on Licking Run. The cost of this purchase was shared equally, and then the immense tract of 1800 acres was divided into twelve equal parts, one part going by, lot to each family. Here their grist mill, iron furnace and forge, their church and school were community projects. And here they practiced, with balanced emphasis on each, individualism and the general welfare, an exhibition, if you will, of our future Democracy at work. Today, then, we lay claim to our heritage – to their democratic ideals, their quiet, unobtrusive independence, their efficient craftsmanship, and to their indomitable courage – and we freely appropriate these verities and proclaim our use of them as cornerstones of the Foundation, established to their memory and promoted in their honor. But concurrently we admonish ourselves that the enduring structure is yet to be built. Upon greeting each other today as members and friends of The Memorial Foundation of the Germanna Colonies Virginia, let it be said sincerely that this first Reunion is our book of beginnings and our story without end. Dr. Katharine L. Brown’s definitive history of The Germanna Foundation for the Golden Anniversary in 2006 relies on original records beginning in 1927 with the first stirrings of inquiry into the Germanna Colonies. Brown traces the chain of events that led to the Memorial Foundation’s 1956 incorporation and its accomplishments since then. 200 pages, fully documented, annotated, indexed and illustrated with rare photos from the 1920s through 2006.